Norman Abrams served as acting chancellor of UCLA in 2006-2007. He retired from the Law School faculty in 2007 with the titles of Acting Chancellor Emeritus and Distinguished Professor of Law Emeritus. He continues to write in the areas of anti-terrorism law, federal criminal law and evidence, and periodically, has been recalled to teach. Abrams joined the UCLA Law School faculty and has been a member of the UCLA family since 1959. From 1991 to 2001 he served as UCLA's vice chancellor of academic personnel, overseeing faculty appointments and promotions on the campus. He served as interim dean of the law school from 2003 to 2004, and earlier had served as associate dean, from 1989 to 1991. In 2012, Abrams received the Lifetime Distinguished Service Award from the UCLA Emeriti Association. 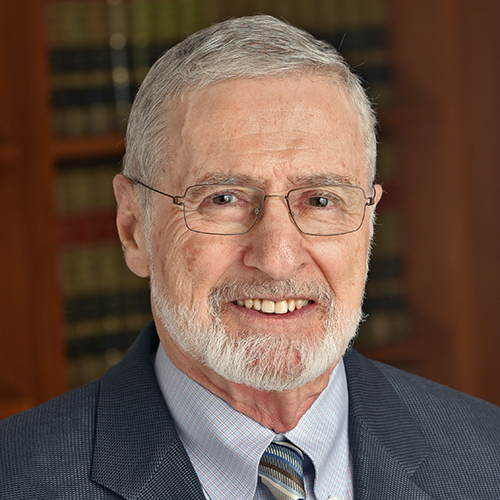 Abrams is the co-author of the sixth edition of the groundbreaking casebook on federal criminal law, Federal Criminal Law and Its Enforcement (with Beale and Klein), published in 2015. Another of his books, Anti-Terrorism and Criminal Enforcement, (5th edition, 2018), is the first casebook to deal comprehensively with the evolving field of anti-terrorism law and the domestic criminal enforcement process. He is also a co-author of the 10th edition of Evidence - Cases and Materials (2017)(with Judge Jack B. Weinstein, et al.). Over his long career, he has written on many subjects, including prosecutorial discretion, federal criminal jurisdiction, conspiracy law, evidentiary privileges and, more recently, anti-terrorism. A native of Chicago, Abrams holds A.B. (1952) and J.D. (1955) degrees from the University of Chicago, where he was editor-in-chief of The University of Chicago Law Review. Before coming to UCLA, Abrams served as an associate in law at Columbia University Law School and as a research associate and director of Harvard-Brandeis Cooperative Research for Israel's Legal Development at the Harvard Law School. He has been a consultant to various state and federal commissions and professional committees, and, while on leave from UCLA, in 1966-67, he was appointed a special assistant to the Attorney General of the United States, serving in the Criminal Division of the U.S. Department of Justice. He has taught as a visiting professor at Stanford University Law School, UC Berkeley Law School, the Hebrew University Faculty of Law, Bar-Ilan School of Law, University of Southern California Law School and Loyola University (Los Angeles) School of Law.